WASHINGTON (CNS) -- The perfect pitch Dominican Sister Mary Jo Sobieck threw prior to a Chicago White Sox game last summer not only went viral but is still out of the park. First, there was a bobblehead in her image and now, she has her own baseball card. Not bad for a theology teacher at Marian Catholic High School in Chicago. And in baseball terms, it's a double, because the money she gets for the cards goes directly to her school's scholarship program. Sister Mary Jo also gets to throw out the pregame pitch April 11 at Busch Stadium in St. Louis before the Cardinals' game against the Los Angeles Dodgers, which isn't bad for the sister who also happens to be a Cardinals' fan. According to news reports, the Twins rank at the top for the sister who grew up in Minnesota, followed next by the White Sox, but her favorite team in the National League is the Cardinals, whom she discovered and went to plenty of games to see, when she moved to Springfield, Illinois, to join the Dominican sisters there in the 1993. 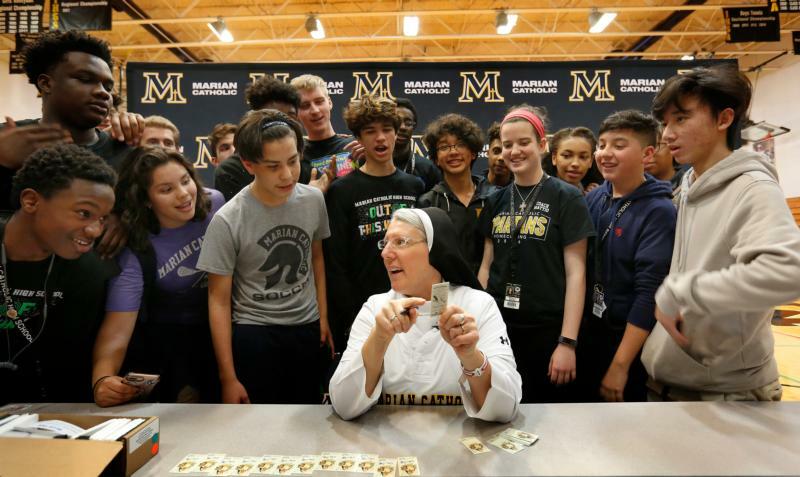 On April 8, she signed 260 limited-edition baseball cards bearing her image in the gym at Marian Catholic High School. The baseball card company, Topps, contacted her after her famous pitch last August and said a card picturing her would be perfect for their Allen & Ginter series, which also features pop culture icons and historical figures in its packs. The image on the card is when she came off the mound pointing at White Sox pitcher Lucas Giolito, who caught her pitch. She is wearing a Marian Catholic T-shirt over her white habit with the number "60" on it for the school's 60th anniversary. She was chosen to throw out the first pitch that night because it was Marian Catholic Night at the park. For the card deal, Sister Mary Jo receives $1,000, which she is donating to the Sister Mary Jo Endowed Scholarship fund, established after she threw out the now-famous pitch. The school has promoted the fund on social media noting that Sister Mary Jo is asking for matching funds for those who support Catholic education. All of this fame might be new to the Dominican sister, but she's hardly new to the sport that brought her to this level. In elementary school, high school and college she played softball, basketball and volleyball. She certainly never imagined she would be on a baseball card. "It is so out there," she told the Chicago Tribune. "As a kid and athlete growing up, you always went to the store and bought the baseball cards and bubblegum." She also told the newspaper she sees a lot of parallels with religious life and sports. "For me, religious life is also a team," she said, adding that it requires "a lot of discipline, a lot of spiritual exercise."